On June 6, 2013, the BBC’s staff were reportedly the first Western reporters to enter Qusayr, after Syrian regime forces backed by Hezbollah fighters declared the town’s takeover. Qusayr had been under the control of armed opposition fighters for nearly a year, and the battle for the town marked the official and overt entry of Hezbollah into the war. While the Saint Elias Church was not the first religious edifice to be damaged in the ongoing war in Syria, it gained notoriety amid the Western media’s focus on the battle of Qusayr. However, the media gave only a narrative of the result of months of ongoing fighting. But what happened during this time in Qusayr? How did events surrounding the church unfold? And what are the causes of the damage inflicted to the church? What happened to Qusayr’s Christians? By the summer of 2012, after many months of intense fighting, most of Qusayr had fallen to the rebels. The turning point in the battle occurred around July 9, when the Free Syrian Army (FSA) fighters seized the town hall – the main headquarters of the government forces – a mere 100 meters from Saint Elias Church. The preceding months of heavy clashes had triggered a mass civilian exodus from the town. Already in late February 2012, a rebel commander had announced that 60 to 70 percent of the town’s 40,000 residents had left. Prior to the exodus, Christians made up one quarter of Qusayr’s population. Some of them supported the uprising, while others were staunchly pro-regime. BBC correspondent Paul Wood, who happened to be in Qusayr in February 2012, witnessed the beginning of what would unfold to be sectarian tensions. Some FSA elements kidnapped army corporal Joseph Hanna, a Christian regime supporter, for setting up checkpoints and allegedly firing on demonstrators. In retaliation, Hanna’s brothers kidnapped six Sunnis. The families of the six kidnapped Sunnis responded by abducting around 20 Christian men. Finally a deal was struck, where all abductees were released, on the condition that Hanna and his family leave Qusayr permanently. At that point, that was the only overtly sectarian event in Qusayr. And there is no indication that the 25,000 or so inhabitants – Christians and Muslims – who had fled Qusayr by the end of February 2012, did so because of sectarian threats, but rather as the result of the continuous fighting, or for political reasons. However, the situation started to deteriorate after a couple of months, with the growing strength of radical Islamists, local and foreign, while the FSA leadership stood by and watched. This period also gave rise to a local preacher-turned-brigade-leader, Abdel Salam Harba. On June 2, according to the Vatican news agency Fides, Harba issued an ultimatum to Christians to leave Qusayr .This news was corroborated by other sources, mainly a pro-rebel Christian interviewed by Paul Wood. In a statement sent to Fides, the FSA in Qusyar expressed their shock at the news “and reject[ing] the ultimatum, saying that it is not responsible and does not share it in any way.” Also, it appears that by the middle of June, a radical Islamist group had turned St. Elias Church into their headquarters. I was not able to find the recording of the threat issued that summer. However, in a mosque sermon on October 12, 2012, Harba threatened Qusayr Christians, saying that “there is nothing left for them in Qusayr,” “there is no return for them to Qusayr,” and that “Qusayr Christians are traitors,” to the evident approval of his audience. There are no statistics on the number of Christians who left Qusayr by the time of Harba’s ultimatum, but it seems that most of them left during the summer, with few remaining in the town until December 2012. In early June 2013, at the time of fall of Qusayr, the Christian population seems to have dwindled to four people: an elderly couple and two other men. How did events surrounding the Saint Elias Church unfold? It is safe to assume that the church was under rebel control since the fall of the nearby town hall in July 2012 until the beginning of June 2013. 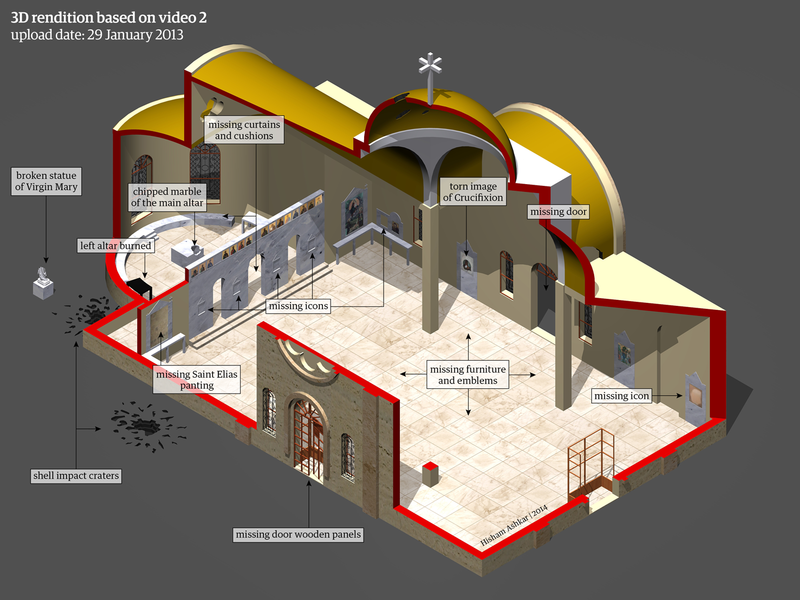 The church was featured in several videos uploaded to Youtube, by the opposition: Two videos, respectively uploaded on June 11, and 15 July 2012, alleged that the church had been bombarded by regime forces. However, the footage does not show direct hits to the church. A video published on October 3, 2012, after the June ultimatum and before Harba’s October speech, shows the interior of the church nearly intact, while a further video uploaded after the date of this sermon, on January 29, 2013, shows the church’s devastated interior. A video from March 15, 2013 depicts further damage to the church’s exterior, as well adjacent abandoned Syrian army positions. While another video dated May 21 reveals some fighting next to the church. It is evident from the footage that the edifice was still in rebel-controlled areas. Moreover, a video dated June 2, shows a rebel field tour next to the church. Three days later, Qusayr fell to the Syrian regime forces, and since then a lot of material on the church has emerged. The video from October 3, 2012 shows an abandoned but nearly intact church. It has sustained some shelling to its roof, likely from regime artillery fire, resulting in shell impact holes, broken glass, and fallen chandeliers. Two icons from the templon are missing, but this would hardly constitute desecration or vandalism. The video from January 29, 2013 reveals further damage inflicted on the church. Some might have resulted from shelling, which appears to be the case with the Statue of the Virgin Mary (the video shows a shell impact crater next to it.) However, most damage appears to have resulted from either looting or vandalism. Nearly all items of discernible value are missing, including chandeliers, emblems, and even wooden panels from the main entrance door. On the other hand, there is evidence of vandalism linked to religious zealotry. The marble of the main altar has been chipped, an adjacent altar was burned, an image of the crucifixion was ripped, and many icons are missing. It is worth noting that, with the growing hegemony of radical Islamists, a Wahhabist interpretation of Islam appears to be at work in Qusayr. A testament to this is the destruction of a 200-year old tomb inside the Grand Mosque of Qusayr by the Brigade Shield of Islam. Following the fall of Qusayr to the regime and auxiliary forces, the church edifice sustained additional damage from various types of weapons as a result of fighting. Yet, the most remarkable element is a series of graffiti scribbled on the wall in the back of the church. – The religion of our leader [Prophet] Mohammad will be victorious over tyrants, by God’s will (سوف ينتصر دين سيدنا محمد (ص) باذن الله على الطغاة). – O Bashar do not challenge me, you can’t have Qusayr (يا بشار لا تتحداني هاي القصير مانك قدى). – Long live Syria and down with the pig Bashar. Syria is ours and not for the house of Assad, means the girafe (عاشت سوريا و يسقط بشار الخنزير. سوريا لينا و ما هي لبيت الأسد، يعني الزرافة). – FSA, or we burn the universe (الجيش الحر أو نحرق الكون). – The brigades of FSA passed through here – al-Farouq brigade (من هنا مرت كتائب الجيش الحر – كتائب الفاروق). – God’s speed to the FSA (الله محي الجيش الحر). A couple of days later, in a video published on 14 June, some additions were written with a thick black pen next to the previous graffiti. These did not exist in the footage uploaded directly after the fall of Qusayr. Next to the name Bashar, it now says “who can match you,” and beside the word “pig,” it says “the donkey army,” in reference to the FSA. Moreover, a couple of months later, new graffiti appeared on the exterior wall of the church: “We are all Hanna” (in a possible reference to Corporal Hanna or to Hanna Kassouha, a prominent pro-regime member killed with his son earlier that year). Dictionaries usually define desecration as treating a sacred place or thing with violent disrespect. However, this is a broad definition, since it does not differentiate if these actions were directed against what this sacred place represents of symbolism and beliefs, or not. People usually tend to make this differentiation, and in our case it is best reflected by Doucet’s report: “The church […] was not just destroyed, it was desecrated.” The damage inflicted to Saint Elias Church was caused by various actors and for different reasons. They can be sorted in three categories: warfare, looting, and religious beliefs related actions. And it is only the last category that this research will consider as desecration. At the end of the day, religious edifices are architectural structures. In an urban warfare scope, they can sustain damage similar to any other buildings. 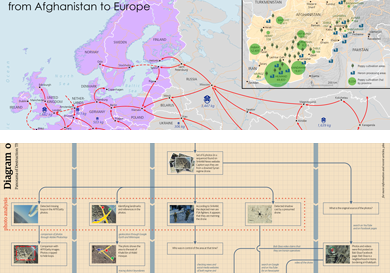 Witness to that are hundreds of churches bombed during World War II, and that in Great Britain and Germany alone. Moreover, the sanctity of churches never spared their use for a military or a logistic end. In medieval Europe, strategically ill-situated religious buildings were usually demolished. Furthermore, having a large hall, churches are very useful to station troops, or as field hospitals (as these examples from World War I show). Graffiti is also an action related to warfare, as long as they are signatures, or boasting fighters achievements or moral, and/or targeting the opposing warring parties. The FSA, Hezbollah, and pro-regime graffiti, found in Saint Elias Church, falls into this category. There is only one piece of graffiti that seems out of pace with the rest: “Infidels.” However, there is no indication that it is directed towards Christians. Different warring parties in Syria have been using religious-related terms to discredit each other, and this graffiti fits more with the rebels description of the regime, than of Christians. War presents a propice opportunity for looting activities. Looting can arise from the prospect of financial gain or for their practical use. From this perspective there is no big difference between looting a church or a store or a house, since the main target is not the place itself, but rather what it contains of valued or useful items. In the case of the church in Qusayr, chandeliers, emblems, or air-conditioning units can be sold to generate some profit. For other items, it is hard to perceive a financial gain out of them, such as the main door’s wooden panels. In this case, for example, they can be used as fuel (note that the wooden panels were removed from the main entrance door without breaking it). Several act of desecration were committed in Saint Elias Church. The image of the crucifixion was torn, a painting of Saint Elias was slashed, the main altar was chipped, and the left altar was burned. In the last case, the video on January 29, 2013 shows that the adjacent room to the left of the altar, the Diaconicon, is also burnt. However, the fire in the Diaconicon appears to be caused by the shell that landed next to the room’s window (and which is also probably behind the damage to the Statue of Virgin Mary.) The same video also shows that there is no sign of fire propagation between the Diaconicon and the left altar, suggesting that the two fires are not related. In terms of accountability, all the warring parties are responsible for the damage inflicted to the church. However, the desecration part was carried by fundamentalist Islamists. The shelling, as well as the fact the church was in rebel held areas for most of the time, indicate that the Syrian regime and its allies are behind most of the physical damage to the structure, due to fighting. As for the looting, we should not exclude the possibility of the participation of non-fighters and non-fundamentalist residents of Qusayr in this activity. In the past two years, desecration incidents were rife in Syria. In March this year, icons were defaced and statues were beheaded in Yabroud. A couple of months before, the Islamic State in Iraq and Syria (ISIS) destroyed the crosses of the Armenian Church of the Holy Martyrs, before turning it into their guidance office. And in December 2012, in Zarzour, FSA brigades converted a Shia Mosque into a Sunni one. In comparison, the desecration in Qusayr seems limited and selective. It does not appear to be systematic, but rather selective. For instance, several icons and paintings are still in their place and intact, and crosses were not destroyed. Did someone intervene and stop the desecration process? This is by no means to belittle what happened in Qusayr. Although a religious edifice symbolizes the religious community, and thus an attack on this edifice is an attack on the community, in the case of Qusayr, it looks that the wrath of fundamentalists was more towards the community, than towards their symbols. Several news media reported on the fate of Qusayr’s population, especially its Christians. However, besides military operations, the focus was on Saint Elias Church. The Wall Street Journal used it as an evidence of “an intensifying Holy War.” The Irish Times put it in parallel to other religious edifices, claiming that “only the Shia and Sunni mosques have survived the onslaught.” A claim which is not only far from reality, but also has the potential to stir further sectarian tensions. Qusayr was in the spotlight of the international media, not because of the scale of human tragedy or the desecration of its church, but simply due to the participation of Hezbollah in the battle. A matter that leads to the questioning of the media’s priorities. International media, that without thorough investigation, just emulated the warring parties narratives, especially the latter’s instrumentalization of Christians, or other minorities, in the conflict. The Syrian regime’s propaganda claims it is a secular regime which protects minorities, while at the same time, it has been killing, torturing and imprisoning its citizens, regardless of their faith. The overwhelming majority of rebel brigades are doing the same, while claiming to protect “our Christian brothers” or other “brothers.” It seems the fundamentalist Islamists are the only ones who show a concordance between their actions and their discourse, and with a tragic consequence to all of the population, including the Sunnis who they claim to protect. Religious edifices will be rebuilt, they might even have larger volumes too. The desecration and the offense to religious communities will be mended through reconciliation ceremonies, headed by notables and religious figures. Only the common people will bear the brunt and will keep on suffering, regardless of their religious labeling. 1. ↑ According to the Syrian census in 2004, al-Qusayr had a population of 29,818. 2. ↑ The video was uploaded on the same day. Another video of the sermon is titled Friday of the Free of al-Sahel Make Victory, which is the friday of 12 October 2012. 3. ↑ It seems that the regime has positioned tanks in front of the Church back in June 2012. 4. ↑ Marjan De Smet, “Heavenly quiet and the din of war: Use and abuse of religious buildings for purposes of safety, defence and strategy”, in: The Use and Abuse of Sacred Places in Late Medieval Towns, ed. Paul Trio and Marjan De Smet (Louvain, 2006), pp. 1-26. 5. ↑ Stephen Starr, “Strategic Qusayr reduced to rubble,” in: The Irish Times, 17 June 2013, p.12. For this research i contacted several concerned parties, from Qusayr media center, to the Facebook page of Saint Elias Church Qusayr, to the uploaders of the YouTube videos. Either i didn’t get an answer, or there was no cooperation. This piece was first published on Al-Akhbar English, 19 May 2014.